I hope you all had a wonderful Christmas!! Here’s a look at what I wore on Christmas Eve! Before we headed over to Drew’s parent’s home we took Dasher to his very favorite spot to play. It’s up the canyon right from our house and it’s called Tibble Fork. We go up there all the time during the summer months and let Dash play in the water and run around, but there’s something so magical about this place during winter time! Oh! How cute is Isla’s on her Snow suit!!! What a place Rach!! It’s a winter dream, specially in Christmas! Perfect location and perfect look! I love the olive and red color combo here. It’s so festive and the backdrop is stunning! Isla is so adorable as always, and I just can’t get over Dash’s face in the last photo. He looks so unamused. Hope you and your family had a wonderful holiday! Both of your hats are so cute! Too cute!! Isla looks adorable in her winter wear!! Awww!! 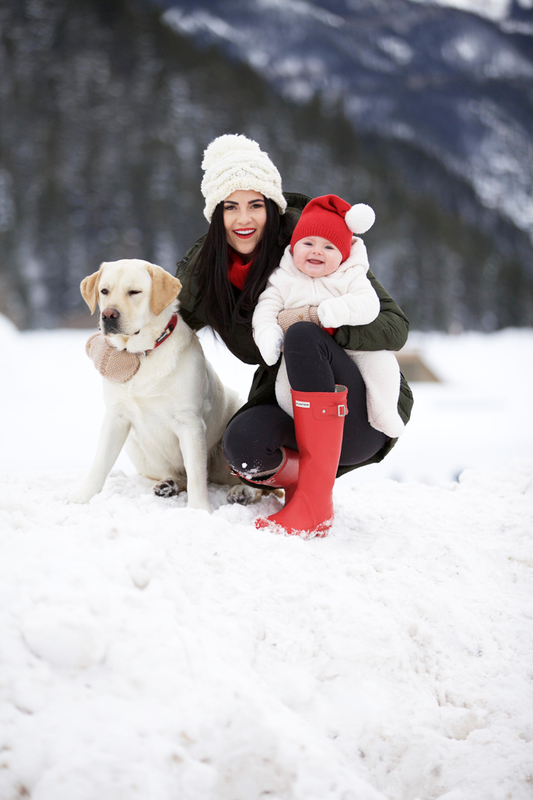 Too adorable photos in the middle of Winter wonderland! Oh my gosh these are adorable!!! Isla is just the cutest! Looks like such a fun day! Love the pop of color from those bright Hunter boots! What an amazing view! Isla looks absolutely adorable!! 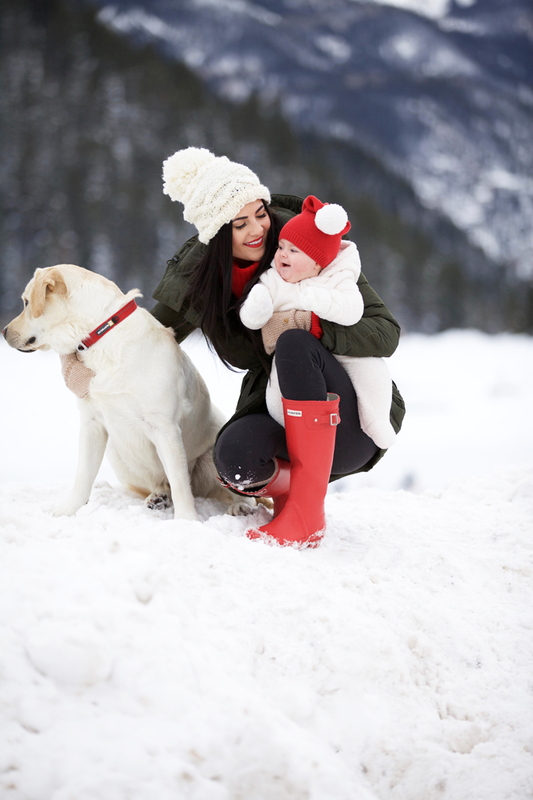 Love these cozy looks on you and Isla! Tibble fork is gorgeous all year round! You look lovely! I love the green and red mixed here. Isla is such a cutie! Looks like a great spot! Love all the snow. Looks like you guys had a wonderful Christmas. Love this outfit you wore and Isla looks so cute <3. What nice photos! I love the cute hats that you and Isla are sporting. Ahhh there’s nothing cuter than a dog running like crazy in the snow. You guys look so bundled and cute. We just got a little bit of snow today! I am ready for some more now after seeing your pictures! Isla is looking so adorable with her bright smile!!! I love the last picture of you, Isla, and Dash. That sounds like a wonderful Christmas Eve afternoon activity!! Your outfit looks so warm and comfy. Love the hat. I can see why he loves it! We drove through Utah on our way to/from Wyoming for Christmas and it was stunning! What a gorgeous state you live in, especially the Provo area! Cute mix of green and red! Hope you had a wonderful Christmas! I love this winter look! That coat is perfection! Looks like a great time in the snow! Hope your Christmas was a happy one! I hope y’all had a merry Christmas! What a beautiful location! I love this winter look! Isla is getting so big and she is so adorable!! These pictures are so beautiful Rach! I love the bright pops of red you always include in your looks, so eye catching and gorgeous! Happy Holidays!! Brr! Looks so cold there but your bundled up outfits are so cute and probably super warm! Hope your Christmas was wonderful! Seriously, that pop of red in these pics just makes it for me!! Great job! This is so cute! I love the red with the olive. Aaahhh! Super cute pics!!! I love the matching pops of red! Love this look! You had more than a white Christmas, happy new year Rachel. Awh so cute love the photos of the baby! Hey boo boo! Stunning shoes and snow day style! Isla’s hat is too cute! Adorable photos!! Looks like you all had fun in the snow. Hope your enjoying the holiday season! Your daughter is so cute in this beanie! Really adorable pictures and white Christmas looks amazing where you were! Thanks for sharing! Little Isla is getting so big, she’s adorable! Cute outfits, especially the pops of red! Hope you enjoyed the holidays! Could you let me know how warm this coat is? I’m considering getting it for the winter here in Canada, would love you feedback. OMG that snow suit is adorable! Looks like this girl will be making a trip to Gap! Quick question though… Thoughts on Zella? I’m obsessed with Airabella Active , and haven’t had the guts to try anything else yet. I’ve heard a lot of good things about zella, so are they worth a try? LOVE the blog by the way! You are gorgeous!